Who says utility shelves have to be ugly? In this set of free woodworking plans, learn how to build simple, strong utility shelves that are quite attractive and will show off your woodworking skills as well. The first step of these free woodworking plans is to cut the plywood for the shelf. To cut the plywood, you may use a table saw or a circular saw with a clamped straight edge (as shown in the picture on this page). The dimensions to which you should cut the plywood will depend on the final size of shelf required for your installation. However, keep in mind that we'll be wrapping the plywood with 1x2 in an upcoming step, so allow for 3/4 inch on the front and each side of the shelf when determining the size to cut your plywood. In my case, the shelf brackets were 12 inches wide, so we wanted a 16 inches wide shelf that was 48 inches long. As such, I cut my plywood to 15 1/4 inches wide x 46 1/2 inches long. NOTE: The reason we recommend cutting the shelf plywood before installing the shelf brackets is that in some installations, holding the plywood in place on the wall is a good visual cue when determining the locations for the shelf brackets in the next step. With the plywood for the shelf cut, the next step is to begin the installation of the shelf brackets. These brackets should be installed to the manufacturer's specifications, but some good general guidelines are when installing on a plastered (or sheetrocked) wall, you'll want the screws for the shelf brackets to be installed into the underlying studs. For attachment on a concrete wall (as shown in the image on this page), use appropriate anchors and screws. Position one of the shelf brackets at the appropriate height (allowing for the 3/4 inch thick plywood shelf and approximately 10 to 12 inches in from the expected end of the shelf location) and mark the hole locations with a pencil, as shown in the picture. TIP: Ideally, you'll want to install one shelf bracket, then use your level to align the second bracket at the proper height (to ensure that your shelf will be level in the final installation). If you intend to install the shelf brackets onto a concrete wall, you'll need to pre-drill holes for the anchors. Using an appropriately-sized masonry bit with a power drill, drill the holes at the locations you marked in the previous step. If the concrete is particularly sturdy (or well-seasoned), you may find a hammer-drill will make the job much easier. If you intend to install your brackets on a wall with wooden studs as a frame (covered by sheetrock or plaster), then pre-drilling likely won't be necessary. If installing the shelf brackets on a concrete wall, you pre-drilled the holes in the previous step. Now, tap in the anchors into the holes in preparation for the mounting screws. Again, this step is likely only necessary if installing the brackets on a concrete wall. Attach the shelf brackets to the wall by inserting a screw through each of the appropriate holes and into the anchors (or into the wall studs at the previously marked locations). Make certain that each screw holds tightly, as the screws will work together with the shelf bracket to support the weight on the utility shelf. With the first bracket installed, repeat the installation steps with the second shelf bracket. Use a level to ensure that the two brackets are installed at the exact same height. For an especially heavy installation, you may choose to install the third bracket in the middle of the shelf. To add strength to the shelf and cover up the edges of the plywood, we'll be using 1x2 (on edge). This 1x2 will have 45-degree miters in the corners and will be affixed to the plywood shelf using biscuits and glue. To begin, make a 45-degree miter cut on a piece of 1x2 (placed on edge on your miter saw). Then, measure the width of the plywood (15-1/4 inches in my case), and square cut the 1x2 at this distance, measuring from the short point of the miter cut. Next, miter cut a second piece of 1x2 a couple of inches longer than the length of the face of the shelf. Position this piece on the front of the shelf, and align the previously cut piece on the side, making certain that the miters match up nicely in the corner. When satisfied with the position, set the front piece of 1x2 aside and make a couple of light pencil marks across the plywood and 1x2 at positions where you want to place a biscuit. Two or three biscuits should be appropriate for the side of the shelf. Also, mark the final length of this piece (at the back side of the shelf) and square cut the piece with your miter saw. Now, after setting up your plate joiner for a 90-degree cut at 3/8-inch depth and preset for a #10 biscuit, make the biscuit slots at the points you marked on the edge of the side of the plywood shelf, as well as at the points you marked on the 1x2 for the side of the shelf. Place a small, even amount of glue into the slots on the shelf and insert a #10 biscuit into each slot. Then, place glue into the slots on the side piece of 1x2 and attach it to the biscuits on the side of the shelf. Re-position the front piece of 1x2 to check the miter joint and adjust the side piece (by sliding it fore or aft on the biscuits) if necessary. You may wish to use a couple of finish nails or clamps to hold the side piece of 1x2 in place while the glue dries. With the first piece of trim attached to one side, continue the process with the front piece of 1x2 trim. Use another short piece of 45-degree mitered 1x2 on the opposite side to help you determine the exact length to cut the front trim piece. Then, mark locations for biscuit slots every 9-12 inches and cut the slots in the front piece of the trim and front edge of the plywood. Insert glue and biscuits into the slots on the plywood and attach the front trim piece (with glue in the trim piece biscuit slots as well). Align the miters in the corner properly and hold the front trim piece in place with clamps or finish nails. Continue the process by attaching the final piece of trim on the opposite side of the shelf from where you started, using the same steps as above. Tip: You may wish to help strengthen (or maintain the integrity of) the mitered corner with a couple of finish nails, nailed from one trim piece (through the miter) and into the other trim piece. You can countersink the nails and fill the holes using wood filler. Another Tip: Avoid using too much glue on the biscuit joints, particularly if you intend to use stain as the finish on the shelf (as a stain does not cover glue very well). If you do experience glue run-out, try to clean up the excess glue with a slightly damp, clean cloth as quickly as possible. With the woodworking on your utility shelves completed, it's time for some finish. Begin by filling any countersunk nail holes or blemishes in the wood with wood filler. Allow the filler to dry completely, then begin sanding your shelves, using progressively finer grits of sandpaper. You may choose to sand by hand or use a random orbital sander. When satisfied with the sanding, clean all sawdust from the shelves and apply your chosen paint or stain finish. 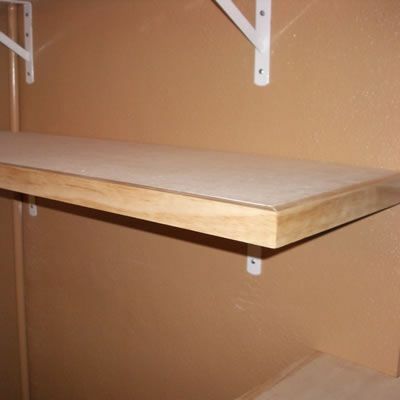 If staining, you may wish to apply a few coats of polyurethane to protect the finish of your utility shelves. Once the finish has been completed, the last step in these free woodworking plans is to attach the shelves to the brackets. Position the shelves in their desired final location and pre-drill some shallow holes in the underside of the plywood (through the holes in the shelf bracket). Take care that you do not drill all the way through the plywood, thus damaging the top side of the shelves. Attach the shelves to the shelf brackets using some 5/8" long, #8 pan head or flat head screws.